Note: You can enter this giveaway three (3) times per e-mail address per day. Deadline is 11:59PM ET 3.10.18. Whether it’s Sunday dinner for the family or making enough for leftovers to last the week, a roast can be the perfect meal. This Nonstick Roasting Pan from All-Clad is ideal for roasting large cuts of meat like this Coca Cola Brisket or whole poultry. It has tall, straight sides to prevent spills and splattering and the large handles make moving it in and out of the oven a breeze. 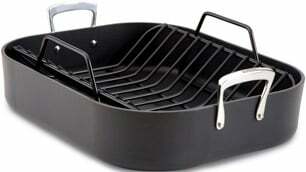 The V-shaped rack that is included allows for even browning and the collection of natural juices in the pan. You’ll need them to make Basic Pan Gravy from whatever you’re roasting. Clean-up is a snap since both pieces are nonstick and dishwasher-safe. NO PURCHASE NECESSARY TO ENTER OR WIN. Void where prohibited by law. Open to legal residents of the 50 U.S., D.C. and Canada (excluding Quebec) who are at least eighteen years old at the time of entry and have internet access. Begins on 1.12.18 at 12:00:00 a.m. ET and ends on 3.10.18 at 11:59:59 p.m. ET. To enter the giveaway, submit your full name and email address on this form. Odds of winning this giveaway depend on the total number of eligible entries received. Only three (3) entries per email address per day. Sponsored by Leite’s Culinaria, Inc. For more information, visit our Official Rules. For a list of winners, check out our Very Happy Winners page. Be sure to add giveaways@leitesculinaria.com to ensure notification if you are the winner.